We're here to help...Emergency Response! 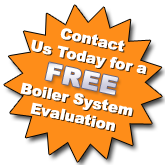 Have an Outdated Boiler or Needing to Expand? Is your boiler acting up and just not doing its job like you need it to; or your demand is growing and you need to expand - then you have come to the right place. Your boiler making strange banging, whistling or gurgling noises and it’s giving you an uneasy feeling that it may burst at any moment? Your boiler isn’t functioning up to speed, or water is leaking all over the ground? The boiler’s pilot light flickers out at the most inconvenient time? You walk into a room where the radiators, powered by the boiler - is cold even though the thermostat in the room is set to 80? We specialize in boilers. It's all we do. From boiler repairs and maintenance, new boiler replacements, parts and boiler rentals, East Polk is The Complete Boiler Source. Our team of highly skilled licensed mechanical service technicians are here to help.